Joining Sapa tours will take you from a green land to the end by paddy fields, maize field, fresh cool water from a waterfall go down and running through out the ravines. The last time before , vehicle travel to sapa by night trains and arrival to Lao Cai early morning, but Nowaday we come to Sapa by highway Hanoi - Lao Cai. You only spend 5hours to Sapa. Catching the advantage of every journey . APT Travel open the new Sapa trip by car for 3 days 2 nights. Discover Sa Pa’s landscapes with a new travelling route – The 245km highway Noi Bai – Lao Cai, now officially open for public use, shortens the time and distance from Hanoi to Sa Pa. Furthermore, tourists are given the opportunity to enjoy amazing sights on Vietnam’s longest expressway before enjoying the beauty of Sa Pa – “the town of fog”. 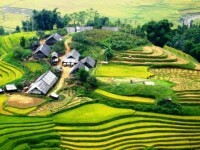 Hanoi - Sapa Party tours 2Days/1 night, by Bus. Joining Sa Pa tours will take you from green lands to the end via paddy fields, maize field, fresh cool water from a waterfall that runs through out the ravines. Go down to the foot of Hoang Lien Son mountain, you will come to the Muong Hoa, to a bridge that crosses the stream to Ta Van village, via waterfalls, Cau May in the village of Giang Ta Chai. Previously , travel to Sa Pa was by night train and arrival to Lao Cai very early morning, but Nowadays we travel to Sa Pa by highway Hanoi - Lao Cai. This route only takes 5hours to arrive in Sa Pa. Utilizing every advantage on the tour. APT Travel opens the new Sa Pa trip by car for the duration of 3 days 2 nights. For a long time Vietnamese and Foreigners have broadly known the area as “Bac Ha” which means “White Plateau”.